ADAMS, John Quincy, (son of John Adams, father of Charles Francis Adams, brother–in–law of William Stephens Smith), a Senator and a Representative from Massachusetts and 6th President of the United States; born in Braintree, Mass., July 11, 1767; acquired his early education in Europe at the University of Leyden; was graduated from Harvard University in 1787; studied law; was admitted to the bar and commenced practice in Boston, Mass. ; appointed Minister to Netherlands 1794, Minister to Portugal 1796, Minister to Prussia 1797, and served until 1801; commissioned to make a commercial treaty with Sweden in 1798; elected to the Massachusetts State senate in 1802; unsuccessful candidate for election to the U.S. House of Representatives in 1802; elected as a Federalist to the United States Senate and served from March 4, 1803, until June 8, 1808, when he resigned, a successor having been elected six months early after Adams broke with the Federalist party; Minister to Russia 1809-1814; member of the commission which negotiated the Treaty of Ghent in 1814; Minister to England 1815-1817, assisted in concluding the convention of commerce with Great Britain; Secretary of State in the Cabinet of President James Monroe 1817-1825; decision in the 1824 election of the President of the United States fell, according to the Constitution of the United States, upon the House of Representatives, as none of the candidates had secured a majority of the electors chosen by the states, and Adams, who stood second to Andrew Jackson in the electoral vote, was chosen and served from March 4, 1825, to March 3, 1829; elected as a Republican to the U.S. House of Representatives for the Twenty-second and to the eight succeeding Congresses, becoming a Whig in 1834; served from March 4, 1831, until his death; chairman, Committee on Manufactures (Twenty-second through Twenty-sixth, and Twenty-eighth and Twenty-ninth Congresses), Committee on Indian Affairs (Twenty-seventh Congress), Committee on Foreign Affairs (Twenty-seventh Congress); unsuccessful candidate for Governor of Massachusetts in 1834; died in the U.S. Capitol Building, Washington, D.C., February 23, 1848; interment in the family burial ground at Quincy, Mass. ; subsequently reinterred in United First Parish Church. Papers: Ca. 65 items in the Adams family letters and several items in other collections. Finding aid. Papers: In Adams family papers, 608 microfilm reels of originals in the Massachusetts Historical Society. Finding aid. Additional papers: Items in American manuscripts, 1703-1806, from the British Museum, 1 microfilm reel, permission required; papers, 1809-1816, from the administrative and chancellery files of the Archives of Foreign Ministry, U.S.S.R., 2 microfilm reels; and correspondence in the David Hosack collection, 1804-1891; the Benjamin Vaughan papers, 1746-1900; and in the Jose Francisco Correia da Serra papers. Also discussed in memoir, 1862, of Samuel Breck (1771-1862), Recollections of My Acquaintance with Deceased Members of the American Philosophical Society. Papers: Correspondence in the Amistad (Schooner) case collection, 1839-1968, on 6 microfilm reels of originals in various repositories. Papers: 1770-1813. 69 items. Personal correspondence, chiefly to Benjamin Rush, manuscripts, and documents. Papers: Miscellaneous items (1742-1842) including treaty with France (signed 1822) and other documents, manuscript poem "To Miss Anna Payne," and letters (1782-1839). Papers: Patent letter (November 18, 1818) and naval appointment (May 23, 1826). Papers: In the John Perkins Autograph Letter Collection, John Quincy Adams letter (October 26, no year) to W. McDonald, Nathaniel Williams, Paul Bentalou, and John Barney apologizing for not being able to attend a meeting where he was supposed to meet fellow Baltimore citizens; and a letter ( September 28, 1817) John Quincy Adams to P.P.F. DeGrand concerning a business venture for pirate ship bounty. Available via the Claremont Colleges Digital Library at ccdl.libraries.claremont.edu. Papers: In United States presidents' papers, 1753-1935. Finding aid. Papers: Miscellaneous items in the Thomas P. Cope letterbooks, 1788-1853; Eleuthere Irenee du Pont papers, 1771-1922; the Eleuthera Bradford du Pont collection, 1799-1834; the Pierre Samuel du Pont Longwood collection, 1438-1954; and the Samuel Francis du Pont papers, 1812-1865. Finding aid. Papers: Letters in Alexander Bryan Johnson papers, 1815-1875. Papers: 1767-1848. 1 container. Notes from his diary concerning Harvard. Access may be restricted, details available at repository. Finding aid. Papers: Correspondence in the James Lloyd papers, 1791-1829; and Joseph Halle Schaffner collection, 1695-1948. Finding aids. Papers: 52 items, including congressional material, in Rufus King papers, 1782-1830. Papers: Miscellaneous items in the William B. Sprague collection, 1799-1857; Josiah Stoddard Johnston papers, 1821-1839; Clement Biddle papers, 1743-1835; Francis Adrian Van der Kemp collection, 1781-1829; Hopkinson family papers, 1735-1863; William David Lewis papers, 1800-1918; and other collections. Finding aid. Papers: Letter (March 17, 1827) to Charles Carroll; reply (March 19, 1827) from Carroll; and "Ebony and Topaz" toast in Adam's handwriting satirizing the posthumous heraldic award to Major General Robert Ross, commander of British troops who marched on Washington by way of Bladensburg in August 1814. Papers: 1 letter (February 16, 1797) in the Bookfellow Foundation autograph collection of letters of U.S. presidents, 1793-1945; and 1 letter (September 12, 1792) and 1 land patent (December 5, 1826) in the Sang autograph collection of U.S. presidents, 1751-1954. Papers: In the Adams family papers, 608 microfilm reels of originals in the Massachusetts Historical Society; and correspondence and other papers in Adams family collection, 1776-1914. 2 containers. Finding aids. Additional Papers: Correspondence in Jeremy Robinson papers, 1806-1832; George Watterson papers, 1809-1866; Polk family papers, 1767-1859; and William Wirt papers, 1802-1858. Papers: Diary (1779-1848) and letterbooks (1781-1848) in the Adams family papers, 1639-1889. 175 feet. More than 400 other items scattered throughout various collections, including portraits and photographs. Available on 608 microfilm reels. Finding aid. Additional Papers: Items relating to Adams' will (1848) in Richard Henry Dana legal papers, 1847-1891. Papers: 1 letter (September 11, 1838); and 26 letters (November 26, 1783-November 10, 1784) in the Jay papers. Finding aid. Papers: Correspondence in the William Foster papers, 1734-1879. Finding aid. Papers: Correspondence in the John Langdon papers, 1762-1972. Finding aid. Papers: Correspondence in Rutherfurd family papers, 1760-1845. Papers: 1796-1848. 475 items. Includes 224 letters (1814-1827) to and from Albert Gallatin. Additional Papers: Correspondence in the Campbell-Mumford papers, 1719-1891; and Randall J. LeBoeuf collection of Robert Fulton and related material, 1764-1857. Papers: 50 items (1794-1840) in various collections. Includes 3 letters (1834-1838) in the George Bancroft collection; correspondence in the Caesar Rodney papers, 1749-1823; William Jenks papers, 1803-1806; James Hamilton papers, ca. 1740-1867; Samuel Gouverneur papers, 1822-1851; and James Barbour papers, 1792-1848. Finding aid. Papers: 3 letters (1825, 1827, and 1834) in the Benjamin Pickman papers, 1679-1923; diary extracts; and information about Adams' 1824 presidential race in the Andrew Dunlap papers, 1754-1847. Papers: In Adams family papers, 608 microfilm reels of originals in the Massachusetts Historical Society; letter (1808 July 31 and August 8) from Abigail Adams to her daughter concerning John Quincy Adams and other topics; and in the Gertrude Foster Brown papers, 1732-1956. Finding aid. Papers: 1778-1842. 100 letters. To and from Adams. Papers: 19 items; and 16 personal and business-related items in the Hughes collection, 1816-1842. Papers: In Adams family papers, 608 microfilm reels of originals in the Massachusetts Historical Society; and United States Department of State selected papers concerning the missions of John Quincy Adams to Berlin (1799-1801) and Russia (1809-1813), 1 microfilm reel of originals in the National Archives and Records Administration. Additional Papers: Miscellaneous items in the Fowler family papers, 1707-1870; the William Jackson papers, 1782-1828; Morse family papers, 1779-1868; John Trumbull papers, 1750-1961, on 10 microfilm reels; the Pruden family papers, 1572-1941; the Lewis Tappan papers, 1809-1903, on 7 microfilm reels; and several other collections. Finding aids. Research Libraries Information Network In addition to the institutions listed above, items are also cataloged in collections at: Alabama Department of Archives and History, Montgomery, AL; Brigham Young University, Provo, UT; Brown University, Providence, RI; Columbia University, New York, NY; Cornell University, Ithaca, NY; Emory University, Atlanta, GA; Dartmouth College Library, Hanover, NH; Harvard University, Baker Library and Countway Library of Medicine, Cambridge, MA; New York State Library, Manuscripts and Special Collections, Albany, NY; Northwestern University, Evanston, IL; Rosenbach Museum and Library, Philadelphia, PA; Stanford University Libraries, Stanford, CA; State University of New York, Buffalo, NY; University of Michigan, Bentley Historical Library, Ann Arbor, MI; University of Pennsylvania, Van Pelt Library, Philadelphia, PA; and others. Adams, Charles Francis. "Remarks by the President, in Communicating a Letter from John Quincy Adams to Andrew Stevenson." Proceedings of the Massachusetts Historical Society, 2d ser. 19 (December 1905): 504-53. ___, ed. Memoirs of John Quincy Adams, Comprising Portions of his Diary from 1795 to 1848. 12 vols. 1874-1877. Reprint. Freeport, NY: Books for Libraries Press, 1969. Adams, John Quincy. Dermot MacMorrogh, or The Conquest of Ireland. Boston: Carter, Hendee Co., 1832. ___. Lectures on Rhetoric and Oratory. 2 vols. 1810. Reprint. New York: Russell Russell, 1962. ___. Letters from John Quincy Adams to his Constituents of the Twelfth Congressional District in Massachusetts. Boston: I. Knapp, 1837. ___. Letters on the Masonic Institution. Boston: T.R. Marvin, 1847. ___. Letters on Silesia, Written During a Tour Through That Country in the Years 1800, 1801. London: J. Budd, 1804. ___. The Lives of James Madison and James Monroe. Boston: Phillips, Sampson Co., 1850. ___. Parties in the United States. New York: Greenberg, 1941. ___. Poems of Religion and Society, by John Quincy Adams, Sixth President of the United States...with Notices of His Life and Character, by John Davis and T. H. Benton. Auburn, NY: Miller, Orton Mulligan, 1854. Allen, David Grayson, et al., eds. The Diary of John Quincy Adams. 2 vols. Adams Papers, Series I, Diaries. Cambridge: Harvard University Press, Belknap Press, 1981. Auer, J. Jeffery, and Jerald L. Banninga. "The Genesis of John Quincy Adams' Lectures on Rhetoric and Oratory." Quarterly Journal of Speech 49 (April 1963): 119-32. Banninga, Jerald L. "John Quincy Adams' Doctrine of Internal Improvement." Central States Speech Journal 20 (Winter 1969): 286-93. ___. "John Quincy Adams on the Right of a Slave to Petition Congress." Southern Speech Communication Journal 38 (Winter 1972): 151-63. ___. "John Quincy Adams on the War Powers of Congress." Central States Speech Journal 19 (Summer 1968): 83-90. Baron, Stephen Mark. "John Quincy Adams and the American Party System." Ph.D. dissertation, Northern Illinois University, 1978. Bates, Jack W. "John Quincy Adams and the Antislavery Movement." Ph.D. dissertation, University of Southern California, 1953. Bemis, Samuel Flagg. 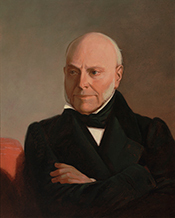 John Quincy Adams and the Foundations of American Foreign Policy. 1949. Reprint. Westport, CT: Greenwood Press, 1981. ___. John Quincy Adams and the Union. 1956. Reprint. Westport, CT: Greenwood Press, 1980. Callanan, Harold John. "The Political Economy of John Quincy Adams." Ph.D. dissertation, Boston University Graduate School, 1975. Clark, Bennett Champ. John Quincy Adams, "Old Man Eloquent." Boston: Little, Brown, Co., 1932. Cronin, John W., and W. Harvey Wise, Jr., eds. A Bibliography of John Adams and John Quincy Adams. Washington: Riverford Publishing Co., 1935. East, Robert Abraham. John Quincy Adams: The Critical Years: 1785-1794. New York: Bookman Associates, 1962. Falkner, Leonard. The President Who Wouldn't Retire. New York: Coward-McCann, 1967. Ford, Worthington C. "The Recall of John Quincy Adams in 1808." Proceedings of the Massachusetts Historical Society 45 (October 1911-June 1912): 354-75. ___, ed. Writings of John Quincy Adams. 7 vols. 1913-1917. Reprint. New York: Greenwood Press, 1968. Frederick, David C. "John Quincy Adams, Slavery, and the Disappearance of the Right of Petition." Law and History Review 9 (Spring 1991): 113-55. Glick, Wendell. "The Best Possible World of John Quincy Adams." New England Quarterly 37 (March 1964): 3-17. Goodfellow, Donald M. "The First Boylston Professor of Rhetoric and Oratory." New England Quarterly 19 (September 1946): 372-89. Harrison, Lowell H. " 'Old Man Eloquent' Takes the Floor." American History Illustrated 13 (February 1979): 22-29. Hecht, Marie B. John Quincy Adams: A Personal History of an Independent Man. New York: Macmillan Co., 1972. Hennes, Bernard R. "John Quincy Adams: The Early Years, 1767-1817." Ph.D. dissertation, University of Texas at Austin, 1957. Howe, Daniel Walker. "John Quincy Adams, Nonpartisan Politician." The Political Culture of the American Whigs, pp. 43-68. Chicago: University of Chicago Press, 1979. Illick, Joseph E. "John Quincy Adams: The Maternal Influence." Journal of Psychohistory 4 (Fall 1976): 185-96. Jones, Kenneth V., ed. John Quincy Adams, 1767-1848: Chronology, Documents, Bibliographical Aids. Dobbs Ferry, NY: Oceana Publications, 1970. Kennedy, John F. "John Quincy Adams." In Profiles in Courage, pp. 31-51. 1956. Reprint. New York: Harper Brothers, 1961. Koch, Adrienne, and William Peden, eds. The Selected Writings of John and John Quincy Adams. 1946. Reprint. Westport, CT: Greenwood Press, 1981. LaFeber, Walter, ed. John Quincy Adams and American Continental Empire: Letters, Papers and Speeches. Chicago: Quadrangle Books, 1965. Lewis, James E., Jr. John Quincy Adams: Policymaker for the Union (Wilmington, DE: Scholarly Resources, 2001. Lipsky, George A. John Quincy Adams, His Theory and Ideas. New York: Crowell, 1950. MacLean, William Jerry. "John Quincy Adams and Reform." Ph.D. dissertation, University of North Carolina at Chapel Hill, 1971. ___. "Othello Scorned: The Racial Thought of John Quincy Adams." Journal of the Early Republic 4 (Summer 1984): 143-60. Macoll, John Douglas. "Congressman John Quincy Adams, 1831-1833." Ph.D. dissertation, Indiana University, 1973. ___. "Representative John Quincy Adams's Compromise Tariff of 1832." Capitol Studies 1 (Fall 1972): 41-58. McLaughlin, Andrew C., ed. "Letters of John Quincy Adams to Alexander Hamilton Everett, 1811-1837." American Historical Review 11 (October 1905): 88-116. Morse, John Torrey, Jr. John Quincy Adams. 1898. Reprint, with new introduction by Lynn H. Parsons. New York: Chelsea House, 1980. Musto, David F. "The Youth of John Quincy Adams." Proceedings of the American Philosophical Society 113 (August 15, 1969): 269-82. Nagel, Paul C. John Quincy Adams: A Public Life, A Private Life. New York: Alfred A. Knopf, 1997. Nevins, Allan, ed. The Diary of John Quincy Adams, 1794-1845: American Diplomacy, and Political, Social, and Intellectual Life, from Washington to Polk. 1951. Reprint. New York: F. Ungar Publishing Co., 1969. Owens, Patrick James. "John Quincy Adams and American Utilitarianism." Ph.D. dissertation, University of Notre Dame, 1976. Parsons, Lynn H. "Censuring Old Man Eloquent: Foreign Policy and Disunion, 1842." Capitol Studies 3 (Fall 1975): 89-106. ___. " 'A Perpetual Harrow Upon My Feelings': John Quincy Adams and the American Indian." New England Quarterly 46 (September 1973): 339-79. ___. John Quincy Adams. Madison, Wisc. : Madison House Publishers, Inc., 1998. ___, comp. John Quincy Adams: A Bibliography. Westport, CT: Greenwood Press, 1993. Quincy, Josiah. Memoir of the Life of John Quincy Adams. Boston: Phillips, Sampson Co., 1858. Rahskopf, Horace G. "John Quincy Adams' Theory and Practice of Public Speaking." Ph.D. dissertation, State University of Iowa, 1932. Remini, Robert. John Quincy Adams. New York: Times Books, 2002. Rodesch, Jerrold Clarence. "America and the Middle Ages: A Study in the Thought of John and John Quincy Adams." Ph.D. dissertation, Rutgers University, 1971. Seward, William Henry. Life and Public Services of John Quincy Adams, Sixth President of the United States, with the Eulogy Delivered Before the Legislature of New York. 1849. Reprint. Port Washington, NY: Kennikat Press, 1971. Shepherd, Jack. The Adams Chronicles: Four Generations of Greatness. Boston: Little, Brown, Co., 1975. ___. Cannibals of the Heart: A Personal Biography of Louisa Catherine and John Quincy Adams. New York: McGraw-Hill Book Co., 1980. Stenberg, R.R. "J.Q. Adams: Imperialist and Apostate." Southwestern Social Science Quarterly 16 (March 1936): 37-49. Tade, George T. "The Anti-Texas Address: John Quincy Adams' Personal Filibuster." Southern Speech Journal 30 (Spring 1965): 185-98. Thompson, Robert R. "John Quincy Adams, Apostate: From 'Outrageous Federalist' to 'Republican Exile,' 1801-1809." Journal of the Early Republic 11 (Summer 1991): 161-83. U.S. Congress. Token of a Nation's Sorrow. Addresses in the Congress of the United States, and Funeral Solemnities on the Death of John Quincy Adams. 30th Cong., 1st sess., 1847-1848. Washington: J. G.S. Gideon, 1848.